If you’re considering a kitchen remodel, there are many things to think about. Many people used tile or linoleum flooring in their kitchens for years. 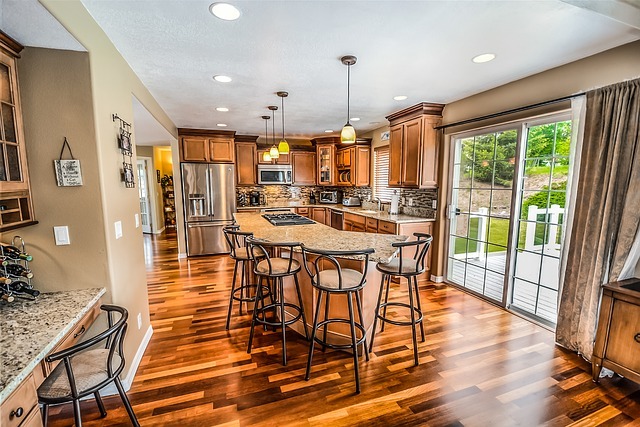 Whether you have an older house or a modern one, here are a few reasons to install a hardwood floor in your kitchen. Before you start your project, decide what type of flooring you want. Modern wood flooring comes in a variety of wood species and textures. You can choose solid wood or engineered wood options. Solid wood is found in nature and grows in a variety of species. These species include oak, maple, hickory, pine, and walnut to name a few. They do react to weather changes because they’re a natural source. The floors tend to shrink or swell depending on your climate. Keep this in mind when you’re choosing flooring. Solid wood needs more maintenance than engineered wood. If you want to keep it looking like new, polish and wax it regularly. These floors are high-quality and are very easy to replace or re-finish. If you want a lower maintenance option, choose engineered wood. This wood dents and scratches less than solid wood. This type of wood doesn’t react as quickly to humidity either. 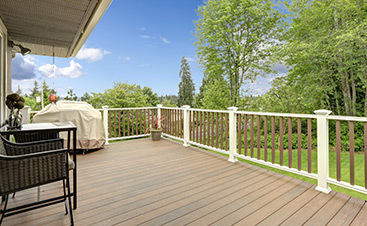 Engineered wood has layers of bonding that hold it together. This is a good option if don’t plan on refinishing your floors. 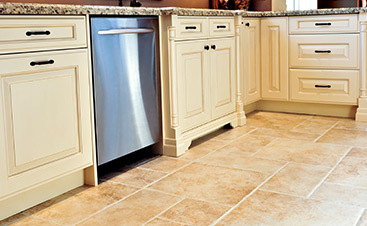 When you’re remodeling your kitchen, you want to replace your flooring with something low maintenance. Hardwood flooring doesn’t have grooves or grout so it’s easier to keep up. If you ever want to replace your flooring, you won’t have to rip it up and restore your foundation. You don’t need to wax and buff the floor each day. A simple damp or dry mop will give your floor a quick dusting and polishing. Considering cost is an important part of the kitchen remodel process. While hardwood flooring is more expensive upfront, there are many long-term benefits. Remodeling your kitchen flooring with a modern choice like hardwood flooring, increase your property value. Depending on the type of flooring you choose, you can expect to pay about $3-$14 per square foot for solid wood flooring. Engineered flooring costs about $3-$10 per square foot. A kitchen is a place in your home where you spend plenty of time. Hardwood flooring is a soft and inviting flooring option. If you do a lot of cooking, this type of flooring is easier on your feet. Your glassware is also less likely to break on a hardwood floor than tile. If your kitchen is a large space, hardwood flooring designs help decorate the room with a little character. Glossy finishes look stunning but the scratch very easily. If you have pets or children in your home, consider choosing a stronger wood. Glossy finishes also show dents and stains clearly. Solid wood choices, like oak, have small patterns that hide imperfections in the wood. It also looks practical in your kitchen. 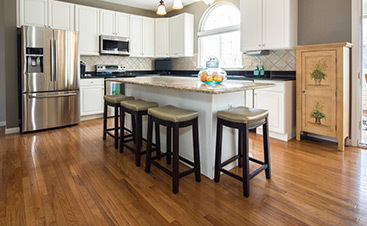 When you’re planning your kitchen remodel, consider this information about hardwood floors. Flortec is happy to help you install any hardwood floor of your choice. If you’re not sure which option is best, we will help you choose the perfect flooring for your kitchen.